Atheneum Books for Young Readers, 9781442496767, 112pp. They’re darling. They’re daring. They know their shapes! They’re chicks on a mission—and on this, their first (mis)adventure, the Chicken Squad launches a galactic backyard expedition. Meet the Chicken Squad: Dirt, Sugar, Poppy, and Sweetie. These chicks are not your typical barnyard puffs of fluff, and they are not about to spend their days pecking chicken feed and chasing bugs. No sir, they’re too busy solving mysteries and fighting crime. So when Squirrel comes barreling into the chicken coop, the chicks know they’re about to get a case. But with his poor knowledge of shapes (“Big” is not a shape, Squirrel!) and utter fear of whatever it is that’s out there, the panicky Squirrel is NO HELP. Good thing these chicks are professionals. But even professionals get worried. Especially once they see that round, shiny, green, BIG thing in the yard. What if it’s a UFO full of aliens who want chickens as pets? 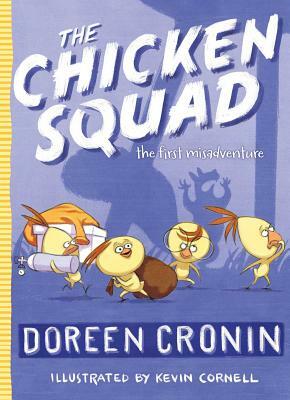 It’s up to the Chicken Squad to crack a case that just might be out of this world. "Cornell’s illustrations give life to the chicks and their individual personalities. Each one pursues his or her own agenda, though they are often united in a common cause. Like four small, fuzzy, yellow Don Quixotes, they see giants in windmills or, in this case, aliens in backyard grills."